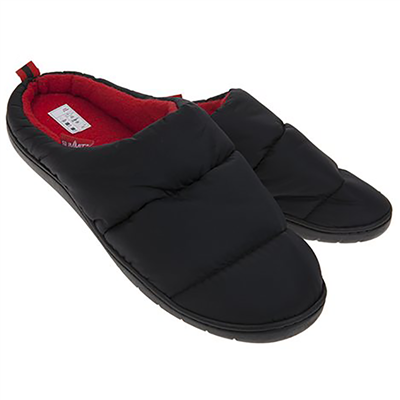 Summit 'Therma Dry' slippers incorporate super warm polar fleece lining with tight knit hollow fibre filling for extra comfort. With a waterproof membrane, you can stay dry and warm whether away camping or at home. I brought these because my normal slippers got really wet when we last went camping. These slippers are so comfortable that i am wearing them at home and your feet stay dry if you pop out in the garden when it is raining. Will certainly be buying more pairs for camping. These slippers are really cosy and perfect for stepping out to hang out the washing or put something in the dustbin. I would have given them 5 stars if they had been slightly smaller - i chose Small [size 4.5 to 5.5] as I usually take 4.5 or 5, but they are rather large and maybe Extra Small would have fitted better. Bought for camping so not worn much at home since I got them but they certainly look good quality and are comfy when I have worn them, and also warm so good for outdoors. Quite large size so don't buy too large a size. Bought these as an add on, but have to say, one of the best purchases I have ever made. Keep your feet dry and warm walking out on the wet grass. Brilliant idea!